Pull on your superhero pants and zoom into action! 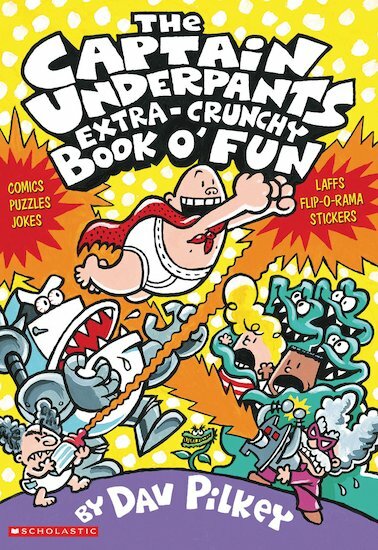 It’s time to join George, Harold and Captain Underpants for fun, games and wedgie-powered pranks! Let rip with gut-busting jokes, crispy chuckles and chunky puzzles. Draw your favourite characters. Make your very own comic book, complete with a world-famous cheesy FLIP-O-RAMA. And fly by the seat of your pants as you pit your wits against frightful Professor Poopypants’s Preposterous Puzzles of Perplexing Peril! May the pants be with you! i readthis last tuesday and did the sticker sort of stuff. It was fun reading this book and I also enjoyed doing the activities in this book because it was fun. SSSSSoooooooo funny I love it so funny because what chld goes around in his underpants?!?!?!?!!? !